For the stage musical based on the film, see Newsies (musical). Newsies (released as The News Boys in the United Kingdom) is a 1992 American musical comedy-drama film produced by Walt Disney Pictures and directed by choreographer Kenny Ortega in his film directing debut. Loosely based on the New York City Newsboys' Strike of 1899 and featuring twelve original songs by Alan Menken and an underscore by J.A.C. Redford, it stars Christian Bale, David Moscow, Bill Pullman, Robert Duvall and Ann-Margret. It was the first completely live-action musical that Disney produced. The film was an initial box office bomb and received negative to mixed reviews at the time of its release, but later gained a large cult following on home video. It was later adapted into a highly successful stage adaptation on Broadway that was nominated for eight Tony Awards, winning two. In 1899, 17-year-old Jack "Cowboy" Kelly is one of many struggling newspaper hawkers in New York City, selling copies of the New York World on the streets of Manhattan. When David Jacobs and his younger brother Les join the "newsies", Jack notices David's intelligence and Les's marketable cuteness and self-servingly takes them under his wing. Jack is invited to the Jacobs' home, becomes enamored of their sister Sarah, and sings of his desire to escape to Santa Fe, New Mexico. Attempting to outdo his business rival William Randolph Hearst, New York World publisher Joseph Pulitzer raises the prices that the newsies must pay to buy newspapers from his distribution centers. Angered, Jack and David galvanize the other Manhattan newsies to go on strike. While the others spread the word to newsies in New York's other boroughs, Jack and Les confront Pulitzer and are thrown out of his office. Bryan Denton, a reporter for The Sun, takes an interest in the boys' story. Jack and David take their cause to the Brooklyn newsies, but their leader, "Spot" Conlon, is reluctant to join the strike. This dejects the Manhattan newsies, but David riles them up until they ambush the distribution center and destroy all of the newspapers. Disabled newsie "Crutchie" is captured by Pulitzer's enforcers, the Delancey brothers, and placed in an orphanage called the Refuge, run by the sketchy Warden Snyder, who neglects the orphans so that he can embezzle money given to him by the city for their care. The newsies try to ward off strikebreakers, but the struggle turns violent and turns out to be a trap set by the Delanceys. Just as the newsies are about to be arrested, Spot Conlon arrives with the Brooklyn newsies and the two groups unite to repel the police. Denton puts the story on the front page of The Sun, and the newsies plan to hold a rally. Snyder informs Pulitzer that Jack is an escapee from the Refuge, giving Pulitzer legal cause to have him arrested. Jack has breakfast with Sarah on the roof of the Jacobs' apartment building; he tells her of his desire to flee to Santa Fe, and wonders if she would miss him. The police break up the rally and arrest the newsies, but Denton steps in to pay their legal fines. Snyder testifies against Jack and reveals to the others that Jack's real name is Francis Sullivan; his mother is deceased and his father incarcerated. Jack is sentenced to four years of rehabilitation in the Refuge. Denton is reassigned as a war correspondent and can no longer report on the strike. Jack is taken to see Pulitzer, who offers to waive his sentence and pay him a salary if he will work as a strikebreaker. When Pulitzer threatens to have the other newsies thrown into the Refuge, Jack complies. The boys attempt to rescue Jack, but he tells them to leave. The newsies are shocked and dismayed to see Jack report for work the next day. When the Delanceys attack the Jacobs children, Jack steps in to save them, knowing this will break his deal with Pulitzer. The newsies learn from Denton that their strike has had little effect on public opinion, since the city thrives on child labor and Pulitzer has ordered newspapers not to report on the strike. Using an old printing press of Pulitzer's, they publish a "Newsie Banner" which they distribute to child workers citywide. Denton shares the paper with Governor Theodore Roosevelt, exposing the mistreatment of children at the Refuge. Numerous child laborers join the strike, bringing the city's workforce to a standstill. Jack and David confront Pulitzer, who finally gives in to their demands. Roosevelt has Snyder arrested, releases the children from the Refuge, and thanks Jack for alerting him to the situation. He offers Jack a ride, and Jack asks to be taken to the train yards so he can head to Santa Fe. The newsies are disheartened by this, but Jack returns shortly, having been convinced by Roosevelt that he still has things to accomplish in New York. As the newsies celebrate his return, Sarah and Jack kiss, and Spot gets a ride back to Brooklyn from Roosevelt. Alan Menken's longtime collaborator, Howard Ashman, was too sick from AIDS to work with Menken on this film, and he would eventually die on March 14, 1991. Menken brought in lyricist Jack Feldman to help. 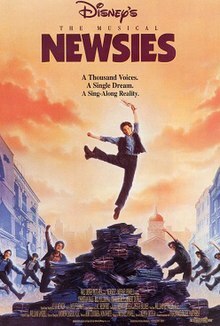 Newsies did not recoup its $15 million budget, making less than a fifth of that at the box office. On Rotten Tomatoes, the film's average score is 39% based on 38 reviews, with an average rating of 5/10. On Metacritic, the film has a weighted average score of 46 out of 100, based on 19 critics, indicating "mixed or average reviews". Newsies has since gained a measurable fan base. The film grossed $2,819,485 domestically and ranks among the lowest-grossing live-action films produced by the Walt Disney Studios. This is due to the film being pulled from many theaters after a poor opening weekend. Film critic and historian Leonard Maltin called it Howard the Paperboy. In 1992, the film was released on Walt Disney Home Video, while a collector's edition DVD was released in 2002. Walt Disney Studios Home Entertainment released the film on Blu-ray, as a 20th Anniversary Edition, on June 19, 2012. The actual Newsboys Strike of 1899 lasted from July 20 to August 2. The leader of the strike was a one-eyed young man named Louis Balletti, nicknamed "Kid Blink", who spoke with a heavy Brooklyn accent that was often phonetically transcribed when he was quoted by newspapers. Kid Blink is featured in the film as a minor supporting character, while the role of strike leader is given to the fictional Jack "Cowboy" Kelly. Kid Blink and another real-life newsie, Morris Cohen, were the inspiration for Kelly. The actual strike ended with a compromise: the World and Journal agreed to buy back all unsold copies of the newspapers. The history of the newsboys strike of 1899 is told in David Nasaw's book Children of the City: At Work and at Play (Anchor Press/Doubleday, 1985; Oxford University Press, 1986). Disney Theatrical Productions produced a stage musical based on the film that played at the Paper Mill Playhouse in Millburn, New Jersey starting on September 25, 2011 through October 16, starring Jeremy Jordan as Jack. Newsies! : The Musical contains songs from the movie, as well as several new numbers. The songs "My Lovey Dovey Baby" and "High Times, Hard Times" were left out of the stage adaptation. Also, the characters Denton and Sarah were combined in the musical to create a new character called Katherine Plumber, a plucky young female reporter who is secretly Pulitzer's daughter. On September 19, 2011 the cast, accompanied by composer Alan Menken, performed "Seize the Day" and "Santa Fe" on The View. The Paper Mill Playhouse version included new songs "The News Is Getting Better" that was replaced on Broadway by "The Bottom Line" and "Don't Come a-Knocking" that was replaced on Broadway with "That's Rich", and the "I Never Planned on You/Don't Come a-Knocking" Medley and "Then I See You Again" sung by Katherine and Jack was replaced with "Something to Believe In". "Fansies" was the term dubbed to fans of Newsies during the Papermill Playhouse run of the show during Newsies Fan Day, where cast members of the movie and the original musical cast met with fans before the show. The musical opened to previews on Broadway at the Nederlander Theatre for a limited engagement from March 15, 2012 to March 28, 2012 in previews and from March 29, 2012 to June 10, 2012 in its official engagement. This was later extended through August 19, 2012 after just the first weekend of previews and then extended again, this time to an open-ended run. They performed "King of New York" in the Thanksgiving Day Parade. The show went on to earn eight Tony Award nominations, including Best Musical, winning Best Choreography and Best Original Score. In late 2016 the casts of both US tours and broadway came together at the Pantages theatre in Hollywood to film a professional recording (dubbed a "proshot" by many theatre fans). The recording would feature people from the original broadway cast but the most notable was the return of Jeremy Jordan in the role of Jack Kelly, to the excitement of fans. In early 2017 it was released to cinemas with a limited engagement by Fathom Events, and returned shortly for encore editions in both the summer of 2017 and early 2018. As of right now, the production is available for digital purchase. ^ "The News Boys (PG/CUT)". British Board of Film Classification. July 30, 1992. Retrieved July 6, 2013. ^ a b Collis, Clark (August 31, 2007). "Spotlight on Christian Bale". Entertainment Weekly. Time. Retrieved March 19, 2018. ^ Knight, Marshall. "Newsies at 25". Laughing Place. Retrieved April 10, 2017. ^ "Newsies (1992)". Rotten Tomatoes. Fandango Media. Retrieved March 19, 2018. ^ "Newsies Reviews". Metacritic. CBS Interactive. Retrieved March 19, 2018. ^ Holt, Kirby C. (April 10, 2002). "Toon Talk - Newsies". Laughing Place. Retrieved February 11, 2012. ^ "Newsies". Christian Bale. Archived from the original on February 16, 2012. Retrieved February 11, 2012. ^ Sorokoff, Stephen (September 26, 2011). "Photo Coverage: Newsies Opening Night Curtain Call!". Broadway World. Retrieved January 12, 2012. ^ Jones, Kenneth (September 21, 2010). "Harvey Fierstein Is Librettist for Newsies Musical, With Songs by Menken and Feldman". Playbill. Archived from the original on October 18, 2012. Retrieved March 19, 2018. ^ Itzkoff, Dave (February 14, 2011). "Extra, Extra! 'Newsies' Musical to Open Paper Mill Playhouse Season". The New York Times. Retrieved January 12, 2012. ^ Rooney, David (2011-09-27). "New York Times Review". Theater.nytimes.com. Retrieved 2012-06-11. ^ Geier, Thom (September 27, 2011). "Newsies musical". Entertainment Weekly. Time. Retrieved June 11, 2012. ^ Jones, Kenneth (November 15, 2011). "Read All About It: Disney's Newsies Gets Spring 2012 Broadway Engagement". Playbill. Archived from the original on June 27, 2012. Retrieved March 19, 2018. ^ "'Newsies' extends Broadway run". United Press International. March 19, 2012. Retrieved June 11, 2012.